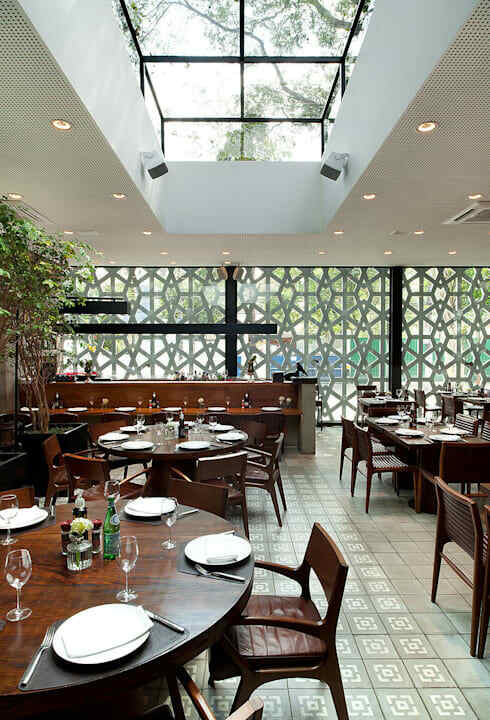 Located in the Vila Olympia quarter in São Paulo, Manish is a Lebanese restaurant designed by Odvo architects. The designers sought inspiration from Arab architecture, and worked to translate traditional elements of that style into a Brazilian context, marrying them to contemporary elements. Thus a Mashrabiya panel, a modern take on the arabesque and a version of an Arabic courtyard, or sahn, all form key elements of the architecture. The result is a bright and airy space that makes full use of the best elements of traditional Arabic design combined with striking modern features like floor-to-ceiling glass. Facing street-side is the Mashrabiya panel. Traditionally, a Mashrabiya is a type of projecting oriel window enclosed with carved wood latticework usually found on the second storey of a building or higher, and often lined with stained glass. In this version, the Mashrabiya is a long panel that encloses the entrance hallway to the restaurant, and protects it from the busy street outside. The lattices are open, but on the other side of the entrance hall is a long glass wall. From the inside, the Mashrabiya seems to be glassed in. Its geometric design was inspired by the modern composition created by architects Howard Ashley, Hisham Al Bakri and Baharuddin Kassim for the Malaysian National Mosque in Kuala Lumpur, built in 1965. The Mashrabiya protects the entrance hall from the busy Rua Horacio Lafer outside, but on the other side of the building, a glass wall opens the space up to the narrow side street alongside with views of its trees and shrubbery integrating the space into its wider environment. Contemporary furniture and dining ware signal that this is not a 'traditional' traditional Lebanese restaurant. 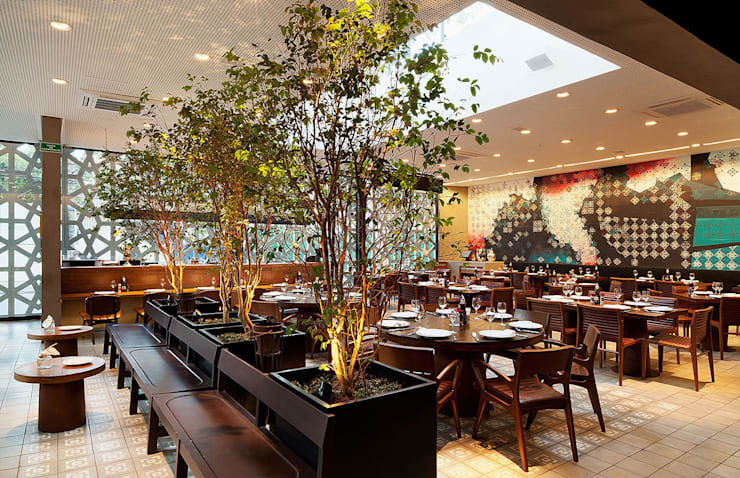 An inner 'courtyard', or sahn, is created by a skylight in the centre of the restaurant. Usually, a sahn is an inner courtyard that's open to the sky and which functions as a private garden or summer dining room. In this version, a sense of a courtyard is created by the skylight, a sense added to by the tall indoor trees that border it. A lounging area is marked off on the opposite side of the trees, and consists of benches and low tables that are perfect for relaxed after-dinner drinks and conversation. The Mashrabiya panel allows light from the street outside to pour into the restaurant, but hides the hustle and bustle of the outdoors from the diners. More light pours down from the skylight, and is reflected off the traditional ceramic mosaic tiles on the floor. The architects have succeeded in creating an indoor space that feels like it's outdoor, simultaneously protected from the noise and bustle of outside while embracing its surrounds. The room has all the tranquility and light of a traditional Arabic courtyard. A huge mural on one wall is a reference to Arab tapestry, and the repeating patterns of the arabesque. It is also a deconstruction of the Mashrabiya, broken up and reassembled into glimpses of patchwork. 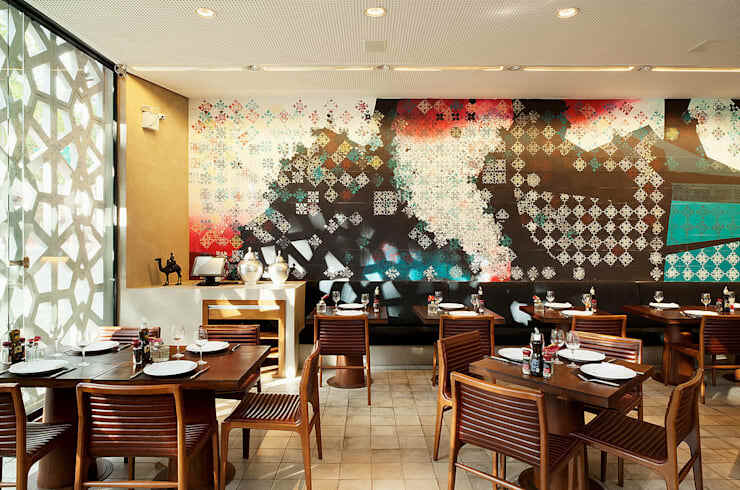 The mural sits opposite the glass wall that runs along the side street; its huge size means that it's visible from that street—the idea was to create a piece of public art—part of the city, not just the restaurant. 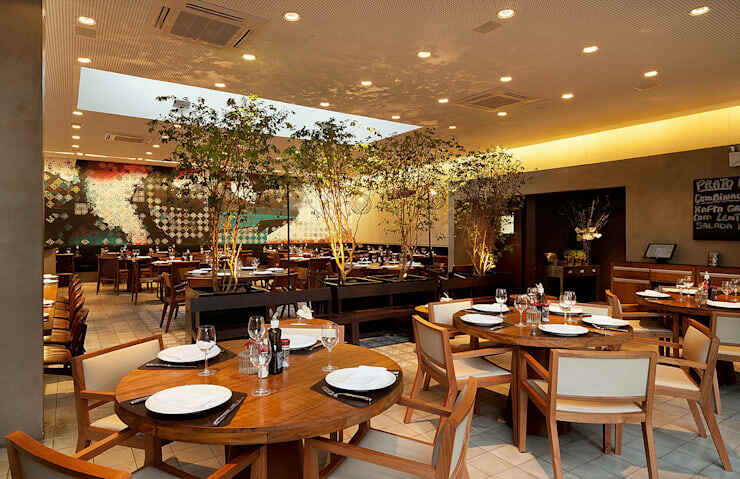 On the other side of the trees lie more tables; the division of space like this into smaller 'rooms' within the restaurant creates a warm and intimate atmosphere of conviviality and sociablity. Dark wood and warm lighting add to the intimacy, while the glass wall mirrors the action inside after dark. 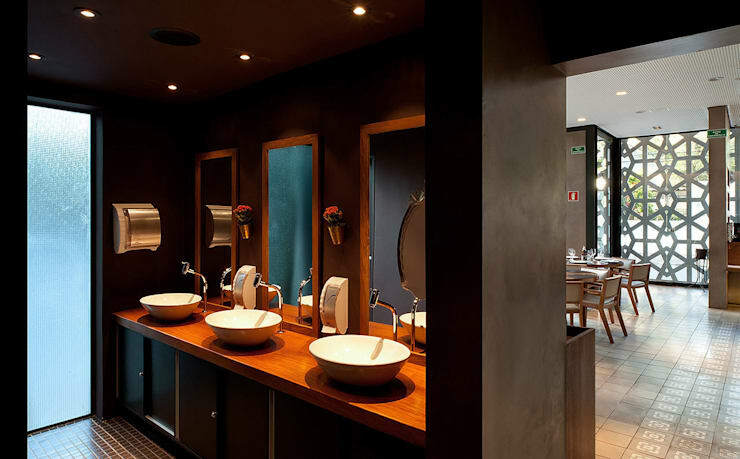 In the bathrooms, the contemporary takes centre stage, with dark walls and low lights creating a very modern space. 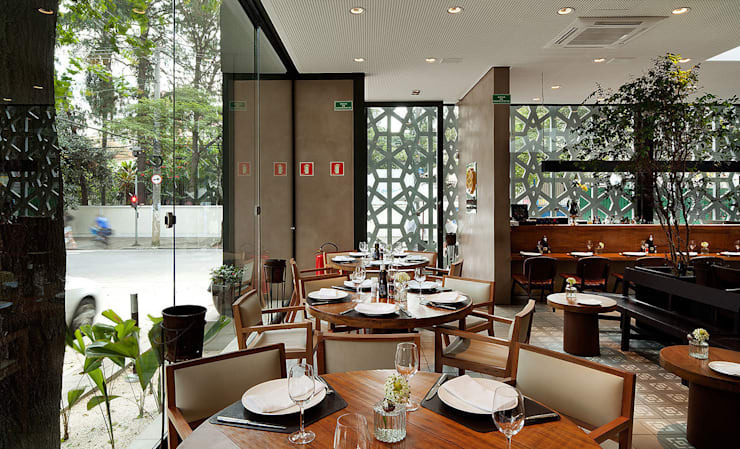 Do you like this restaurant's mix of the traditional and the contemporary? Let us know in the comments!